Tick is an universal table leg system which can be applied to a variety of board materials allowing you the space for individuality and creativity. 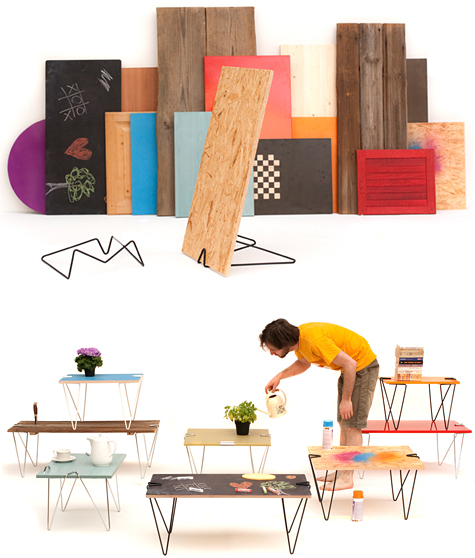 A bent metal wire structure, similar to a over-dimensional paper clip clamps to any board and transforms it within a few seconds into a unique table without the use of screws and tools. Not only does this design allow for universal use, but it allows users to express themselves with a unique surface choice, encourages the reuse of materials (eg. old doors and wood), and it provides a longevity to the product through the ability to swap tabletop materials because of personal taste or wear.